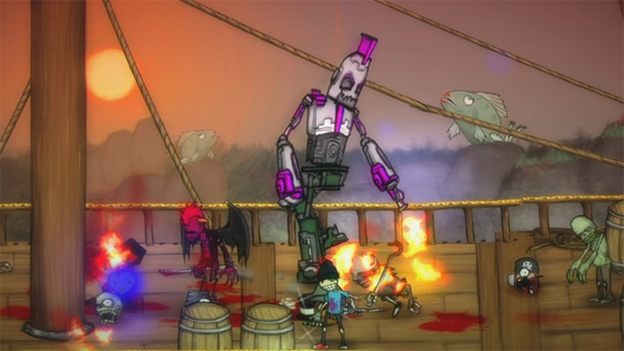 Ever dream of living a life of punk-rock squalor and beating up hordes of zombies too? Me neither, but the idea grows on you throughout the course of Charlie Murder, the latest project of Ska Studios--the two-person team behind I MAED A GAM3 W1TH Z0MB1ES 1NIT!! !1 and the Dishwasher games. Charlie Murder is basically a combination of everything the studio has done to this point and more. 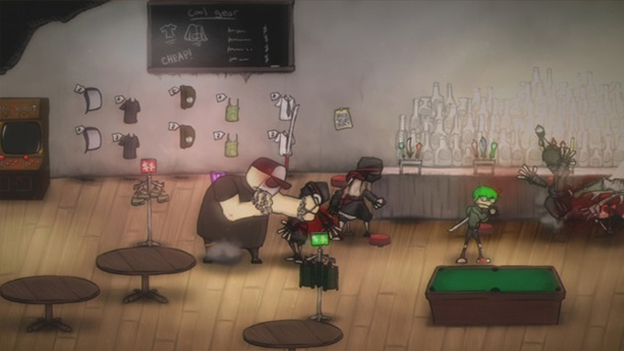 It's a side-scrolling beat 'em up with zombies, graphic cartoon violence, and the occasional shoot 'em-up or rhythm section. And on top of that, a variety of RPG mechanics give this title depth, Castle Crashers style. Though there are some design flaws that can be highly frustrating, on the whole, it's a great buy for $10. The story here is a bit odd. 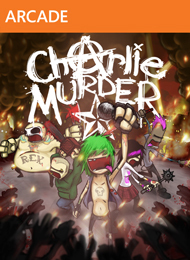 Charlie Murder is a punk band, the five members of which--including Charlie himself, the lead singer--are your playable characters. A rival band that plays death metal is trying to kill Charlie. Also, that band has armies of zombie soldiers. So, you'll need to massacre your way through the undead on your way to taking down the members of the opposing band. Makes sense, right? Well, not really, but who cares? The style here is much more important than the plot particulars. The grungy comic-book artwork is something to behold, and the developers didn't pull any punches creating the most depraved world they possibly could. Sure, there's plenty of blood and guts, but that's old hat to any real gamer--here, you'll come across an orphan who eats glass bottles for fun, and you'll massacre a bunch of innocent people in one particularly disturbing scene. It's just that sick, and the sense of twisted glee is equal parts scary and contagious. The music is a great help, too, with plenty of ratty punk and other loud rock varieties, but the soundtrack also touts the occasional acoustic offering or trippy psychedelic song. It's quite an accomplishment for a small team to pull together such a great assortment of tunes for a game. The basic combat mechanics are nothing special: two attacks, a grab, a jump, and a block. But the enemy design is handled well--easy enough at first that button mashing can be fun, but hard enough over time to demand some strategy--and the game goes to great lengths to make the experience change constantly, from dramatically varying visual environments to new enemy types to gradual shifts in the gameplay. Each of the characters is a little different to begin with (berserker, mage, etc. ), and as you level up, you can select various power-ups and allocate skill points. (The skill allotment is limited, though: At any given level, your skills are capped at a certain point, which forces you to spread the points out a bit.) You'll come across a sizable amount of gear, too, as well as character-specific special attacks you can learn by being tattooed. There's even a crafting system; you'll collect the ingredients needed to make beer and then brew it. In part, all of this is just a process of picking out the best stuff, but it's also a process of developing a style that works for you. And when you're done, you can start again with a different character or play with your friends--the game supports one to four players, local or online, co-op or PvP.